Cupboards Kitchen and Bath: When you live here, who needs Fireworks? 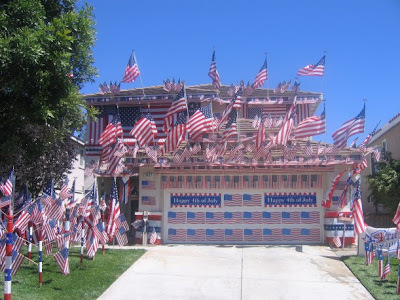 Finishing up with Independence Day celebrations and I happened across this photo- I can't decide if it's over done, or if maybe their neighbors moved here from elsewhere... I couldn't resist- just had to share. Either way, they obviously enjoy the 4th of July- Hope yours was a blast! Isn't it, Brian?! Could you imagine being next door? They are the Independence Day Griswolds!